Should you be wearing a halo or horns? 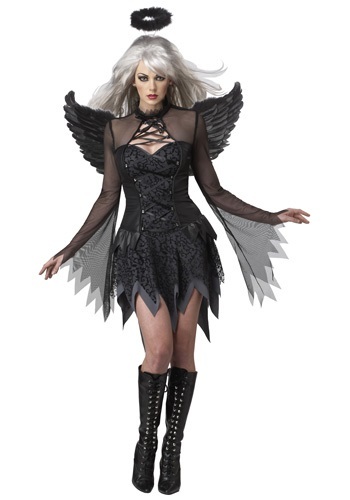 This Sizzling Fallen Angel Costume is a bustier dress with a back zipper and a tiered skirt, made from a polyester/rayon/nylon/spandex blend. The bodice is black poly interlock knit with a shiny wet-look finish. It has a center inset panel of gray interlock overlaid with black flocked tulle and laced with black satin ribbon to resemble a corset. The shoulders and long flared sleeves are black knit mesh. The gathered, tiered skirt has a base layer of gray interlock, with successively shorter tiers of flocked black tulle and two tiers of black shiny interlock. All tiers have jagged edges and are longer in back than in front. The halo is a circle of black feathers on a black plastic headband. 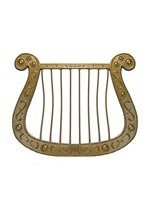 The black feathered wings are on wire frames with elastic straps. 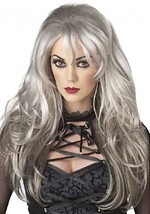 Our matching fallen angel wig goes perfectly with this angel costume!